With so many color choices available from Hirshfield’s, it sometimes helps to take your color for a test drive before you buy! Have you ever tried to match a color swatch in a store only to find it looks like a completely different color when you bring it home? You’ve just experienced metamerism, the occurrence of colors seemingly changing when viewed under different light sources. Some colors are more prone to this phenomenon than others, including tans, taupes, grays, grayed-blues, mauves, lilacs, and grayed yellow-greens such as celadon. View color swatches in the actual space and lighting conditions in which they are being used. So take color for a test drive. Don’t just guess. Know what colors you’re getting before you buy. 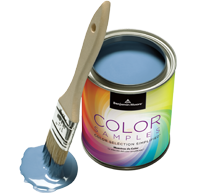 Color Samples are actual paint in one-pint or half-pint containers. Using color samples will show you how our colors will look on your walls, house, porch, or anywhere else you want new color. You can see the colors on their actual surfaces, and in the correct lighting conditions where you plan to paint. It is the best method to make sure you’re satisfied with your color selection before picking up a brush. Interior designers and professional painters apply paint to small sections of the walls to see how the color looks in the actual environment. By sampling a color at home, you will get the most accurate sense of how the color will actually look in the room. • Experiment with several different colors before deciding on a color scheme for a room. • Decide between several shades and tints of a particular color. • Compare how different undertones of a color (vibrant yellow, gray-yellow, green-yellow, etc.) affect the feel of the room. • Determine how a particular color in a room will flow with the colors in adjoining rooms. • Determine how a particular color works with other colors in the room (such as a deeply hued rug). • Experience how a particular color is enhanced by different lighting conditions. Using Color Samples is the best method of making sure you’re satisfied with your color selection before picking up a brush. For best results, a little preparation can go a long way. 1. Make sure the test surface is clean, dry, and in good repair. Note: You will get the truest color rendition when the color sample is painted on a clean, white background. 2. Use different areas of the wall to test different colors. Using a bristle or sponge brush, apply two coats of your Color Sample on the wall. Note: Sponge brushes can be used for testing color, but are not recommended for completing an entire painting project. 3. Keep track of your tested colors. 4. Allow the test patches to dry for two hours for a true representation of the color. Testing your paint color choice in your own home and lighting conditions is the best way to view color. Now, with Benjamin Moore Color Samples, you can choose from over 3,000 colors to try at home. Plus, over 1,400 colors from Hirshfield’s Paint. Demo Color Sample Pints are an economical way to see how your color choices will look in your home environment before committing to your color selection. Color Sample Pints give you ample paint to try your color choices on more than one wall to see how it looks as light changes throughout the day and evening, and to see how it looks with décor elements such as flooring and furnishings. Color Samples Pints are available at Hirshfield’s. Stop in today and pick up a pint of your favorite color today.